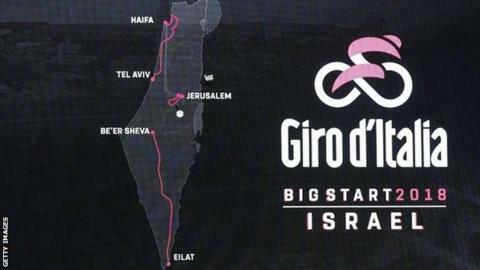 Israel will become the first non-European country to host the start of a Grand Tour when it welcomes the opening three stages of the 2018 Giro d'Italia. A 10.1km time trial around Jerusalem on Friday 4 May will be followed by stages that finish in Tel Aviv and Eilat. The 101st edition of the race starts on a Friday to allow for an extra rest day after stage three for the riders and teams to transfer to Italy. Next year marks 70 years since the formation of Israel in 1948. Although Israel is situated on the western edge of Asia, its sports organisations are affiliated with Europe - the country takes part in European qualifying for the Fifa World Cup, for example. The Giro is the first of the year's three annual Grand Tours, with the Tour de France following in July and Vuelta a Espana starting in August. It is the only one of the three-week races that Britain's Chris Froome has not won, having added the Vuelta to his four Tour titles this summer. It will be the 13th time the race has started outside Italy and Giro administrator Mauro Vegni said: "For us, who for years have spoken about the internationalisation of the Giro, to come to Israel is a unique opportunity to talk about Italy in this country." Israel tourism minister Yariv Levin added: "It's a great honour for us to host the Giro d'Italia, it shows the world has confidence in the ability of the state of Israel to organise a very big sports event." The Jerusalem time trial will begin and end near the walls of the ancient Old City, which is holy to Christians, Muslims and Jews. Stage two follows the Mediterranean coast from Haifa to Tel Aviv and the final stage will begin in Beersheba in the Negev desert and end in Eilat on the Red Sea.